When it comes to American culinary institutions, the Dungeness crabs that are hauled ashore from California to Washington state every winter season are the crustacean equivalents of apple pie. The bountiful crab meat is a holiday staple in the San Francisco Bay Area and beyond. When crabbing was suspended in the fall by an algae outbreak, journalists flocked to docks to produce lead news stories — just as they did when crabbing was restricted following a 2007 oil spill. Research published this month could give a crab connoisseur a case of acid reflux. Scientists reported in the journal Marine Biology that ocean acidification, which is caused when carbon dioxide pollution dissolves into oceans, can kill and stunt young crabs, potentially jeopardizing whole populations. Scientists grew eggs and larvae from Puget Sound crabs in water containing pH resembling current and future conditions. They reported that more acidic seawater slowed the development of embryos and larvae and caused an “appreciable” number of larvae to die. Ocean acidification is caused by carbon dioxide pollution — the same pollutant from fuel burning and deforestation that changes the climate. After carbon dioxide dissolves into seawater, it undergoes chemical reactions that change the pH and remove chemicals needed by corals, shellfish and other creatures to produce rigid body parts. West Coast waters are more prone to acidification than other regions. As the threat of acidifying waters weighs on the minds of crabbers, those who grow shellfish are already being directly affected. The Pacific Northwest’s oyster growing industry has been experiencing substantial losses of young shellfish linked to acidification since 2005. Seth Miller, a Smithsonian Environmental Research Center scientist who wasn’t involved with the new study, said it added Dungeness crabs to the “long list of crustaceans and other invertebrates that will likely be negatively impacted” by ocean acidification during their larval stages. “If Dungeness larvae develop slowly under acidified conditions, they're likely going to struggle even more when you layer on other climate-related stressors like rising temperatures,” Miller said. Miller said the research provides a “first look” at how acidification could affect crab populations. Scientists don’t know whether acidification is affecting crab populations already — nor do they precisely know how it could affect them in the future. “We don’t have any direct evidence that they’re currently being affected, except that in some places we see a decreased survival under conditions that currently exist in some places,” said Paul McElhany, a NOAA ecologist who participated in the new study. 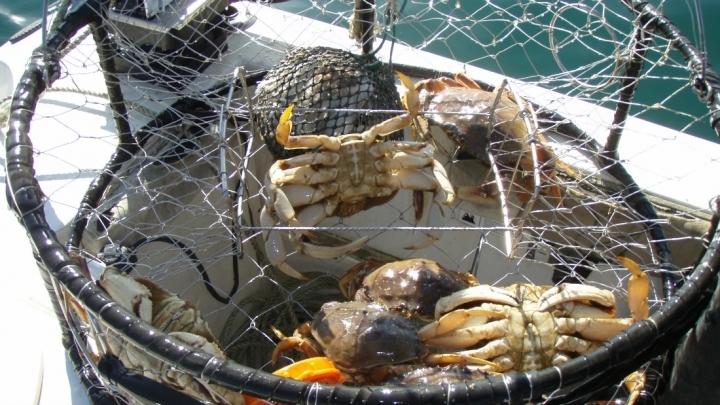 The West Coast’s crab population is a large one, occupying vast territory in the Pacific Ocean, raising hopes that it may harbor enough genetic variety to help it withstand environmental tumult, such as acidification. But how resilient it will actually be remains unknown. The coastal Washington state district of Rep. Derek Kilmer, a Democrat, contains thousands of people whose livelihoods depend on shellfish. He has introduced legislation designed to spur more research through federal grants and innovation prizes. Further research could help determine whether the crabs could evolve quickly enough or learn to adapt to changing pH concentrations. Such research may provide clues as to whether anything could be done to help crabs withstand acidification — apart from drastically curbing fossil fuel burning and deforestation, which is the goal of a new United Nations climate change treaty.